Consistent galloper The New Boy rarely runs a poor race and trainer Danny O’Brien is hopeful that the gelding can record just his second race win this year in the Great Strides Handicap (1400m) at Caulfield on Saturday. The New Boy started his preparation with an unlucky sixth place finish in the Mitchelton Wines Plate (1300m) at Seymour on October 20 and worked home well to finish third behind Chile Express and Felidea in the Emirates Airline Plate (1400m) at Flemington on Melbourne Cup Day. O’Brien admits that The New Boy does not have the best winning percentage, recording just four wins from 26 starts, but the Cox Plate winning trainer told Racing Ahead that he believes he has found an appropriate race for the son of Rock Of Gibraltar. "He doesn’t win out of turn but he is certainly a very honest horse," O’Brien said on RSN. "He drops in weight and gets Damien Oliver on board, which will be a big plus for him, and it is his sort of race there on Saturday." There looks like being a fair bit of speed in the Great Strides Handicap this weekend, with Jason Warren-trained Loot ‘n’ Run the likely leader, but O’Brien still expects Oliver to settle The New Boy towards the front of the field. "I think that is where you have to ride him, he puts himself there so there is no real point dragging him back," O’Brien said. The New Boy scored two wins in his first three race starts, winning the Ben Smith Memorial Plate (1000m) at Cranbourne on April 11 2011 and the Secondbite Plate (1400m) at Flemington a month later, but since then has only been able to win the K.A. 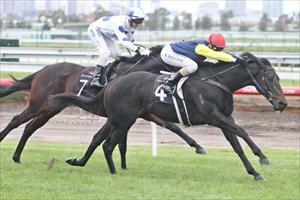 Morrison Handicap (1600m) at Flemington on May 19 and the Community Raceday Handicap (1400m) at Flemington this year. The five-year-old has fallen narrowly short of victory on a number of occasions but O’Brien still believes that the apparent non-winner is his best chance at Caulfield this weekend. "The New Boy will either win or be beaten a head," O’Brien said. "I give him our best chance of the weekend." O’Brien has five runners at Caulfield on Saturday with Pageant in the Leigh Thomas Gift (1700m), Essential Element in the CRV Hospital Helping Hand Plate (1400m), Decircles in the East Malvern Community Bank Handicap (1100m) and Keep Cool in the CFV Ambassadors Plate (2000m).